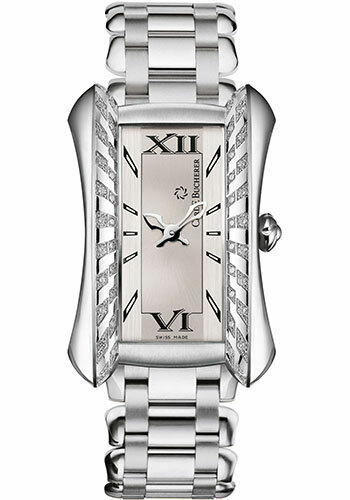 31.3 x 45 mm stainless steel case with 44 diamonds 0.6 ct, 8.7 mm thick, diamond bezel, domed sapphire crystal, silver dial, quartz movement, stainless steel bracelet, folding buckle with stainless steel. Water resistant to 30 m.
31.3 x 45 mm stainless steel case with 44 diamonds 0.6 ct, 8.7 mm thick, diamond bezel, domed sapphire crystal, silver dial, quartz movement, brown python skin strap, pin buckle with stainless steel clasp. Water resistant to 30 m.
31.3 x 45 mm stainless steel case, 8.7 mm thick, domed sapphire crystal, black dial, quartz movement, black galuchat skin strap, pin buckle with stainless steel clasp. Water resistant to 30 m.
31.3 x 45 mm stainless steel case, 8.7 mm thick, domed sapphire crystal, black dial, quartz movement, stainless steel bracelet, folding buckle with stainless steel. Water resistant to 30 m.